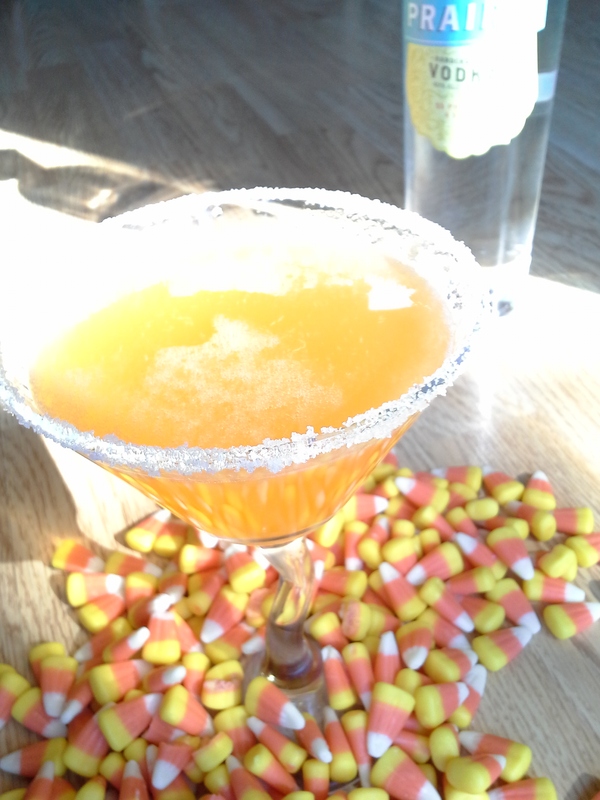 I love the idea of a candy corn martini, and it is so pretty! But I don’t like cocktails that are too sour. If it’s good with lemon, I wonder if it would be good with orange juice (with the Grand Marnier). I might have to make some and try it. Thanks for sharing! Thanks HotDish 😉 I bet orange juice would work well–good call. Am not a big fan of overly sour cocktails, either, so hoping you report back on whether you’d give it a thumbs up or no. 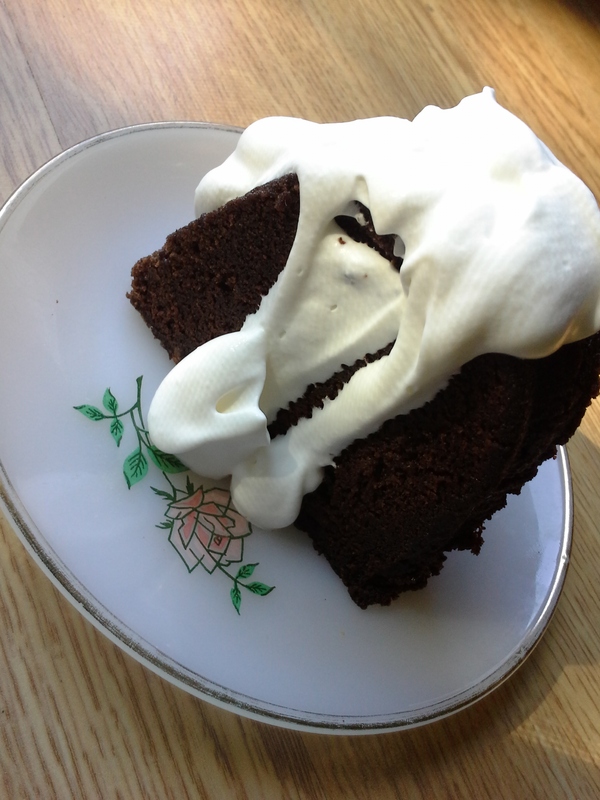 The bourbon chocolate cake sounds divine! 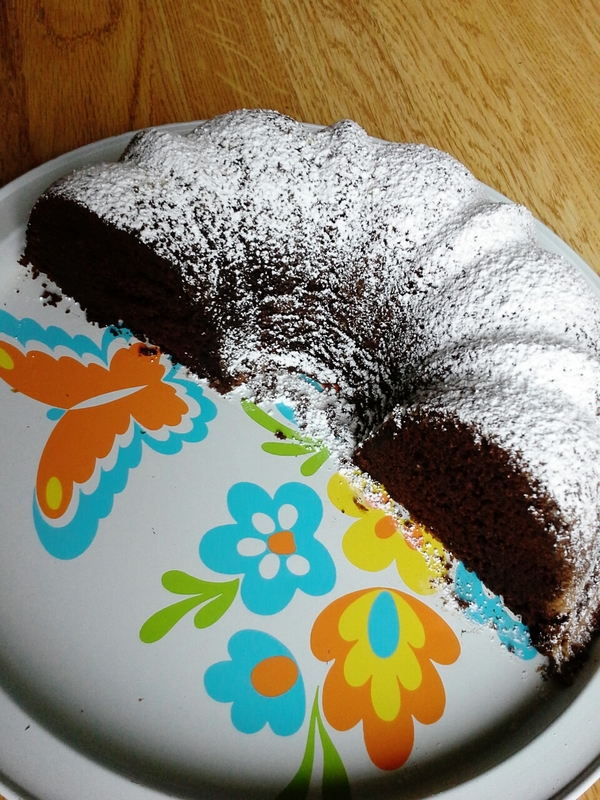 Your cake looks so dense and chocolatey and perfect! I am definitely going to try out the recipe–thanks for the link! For all the alcohol I post, I’m not much of a drinker myself. (Curious: what is your cocktail/spirit of choice?) But all of the possibilities are so much fun. Yes, imagine the hit your party would be if you served candy corn vodka! Where does one begin. Bourbon. Chocolate. Cake. Wow. I remember reading that on Dave’s FB page on his b-day. It looks fantastic. Yum!! Then there is the candy corn “pucker-tini” sigh. I love everything about this post. Thanks for the shout out. The feeling is mutual. Aw, Tracy…shucks and thanks 🙂 Love that you remember seeing this on Dave’s page. Whoever makes this cake for a person’s birthday must really like that person! Will admit to liking the drink more BEFORE I found out it was a “pucker-tini” (all the ‘tinis seem so 1990, lol), but I can see oodles of possibilities with the day-glo orange candy corn liqueur. I think Dr. Who could use it to ward off alien enemies etc, don’t you? I almost said something to that effect, Tracy, but didn’t want to sound (too) ignorant and get it wrong as I still don’t know exactly what the sonic screwdriver is. I’ve seen it, but I don’t really get what it is or what it does. Referencing a conversation from many posts back, if the sonic screwdriver is a beverage, this is the ingredient we’re looking for! It’s OK that you haven’t gotten into Community yet. It’s one of those shows that you start to totally fall in love with after a few episodes, and you need to save it til a point when you are able to devote some time and energy to your Community obsession. It makes even disciplined people do crazy things, like when I introduced my friend Saif (who just started pharmacy school) to the show in March, and he messaged me four days later saying he’d watched all 75 episodes up to that point. Needless to say, I had to introduce him to Amb and they’ve gotten along swimmingly! Thanks for the shout out (even though Courtney and you did all the work)! duly noted re: Community–thanks, Dave. Makes me feel better. I do tend to get sucked into things obsessively (which wouldn’t be obvious at all by my kitchen antics, haha) and am sure I’d be a goner if I watched the pilot. Thanks, Beth! Am glad we connected on FB as now I can at least attempt to keep up with your posts. lol, candy corn vodka being the adult version of making butter. Yep, you won’t be making these recipes with your students anytime soon. Glad to have you here. Oh man. That cake looks amazing. Everything is better mit schlag. Thanks! Your chariot awaits mam. Liz, wow!! First of all that chocolate cake looks and sounds so good. I love bourbon and chocolate and slathered with that whipped cream has me drooling on the keyboard. Candy Corn vodka, whoa!! I wasn’t sure what to think about that but the ensuing drink really sounds delicious. Dare I use the kids candy corn for a boozy drink, I think maybe I’ll have to try, that day glo orange is irresistible. Thanks, Suzanne! Agreed that the color is one of its best features. (Sampled straight, its kerosense-like intensity is not.) I could put it in the windowsill and watch the sunlight coming through and be perfectly happy. Though it’s fun to “cook” with, too. We’re totally adding this to the menu for when I come visit, right? Right?!? Both the cake and the candy corn vodka?! I don’t think I’d be able to choose between the two!!! Yes, candy corn cocktail and chocolate bourbon cake on the list 🙂 No need to choose. Glad you enjoyed reading, amb. Always grateful to have you here as a part of the rock-star commenters. That chocolate cake looks so fabulous and moist. I just love chocolate. Keep it coming. Here’s a candy corn primer, Sophie. Had no idea it was not a universal treat. Basically sugar and corn syrup–healthy? no. sweet and fun? yes. Best part is that it is so sweet a person could only down a small handful (if that) before being over-sugared. lol, it’s essential a lesson. Meant I was giving you a link to Candy Corn 101. I love tart and sour drinks so your pucker-tini sounds perfect to me — and I have a few Halloween parties on the horizon so this is definitely going to be an experiment very soon! Also that cake looks sooo good! 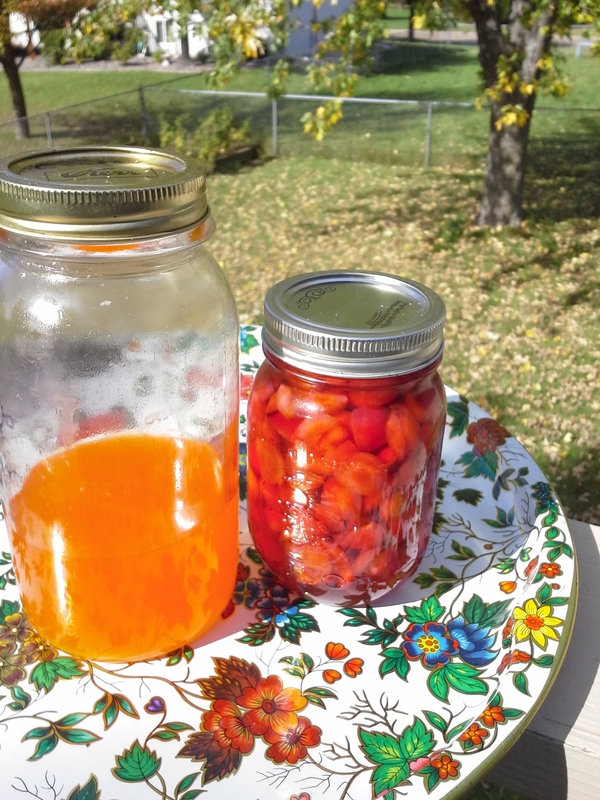 this DIY vodka has Halloween Party written all over it! Please report back any experiments 🙂 Yes, the cake is fantastico. And easy to throw together, too. Highly recommend. Thanks for the mention, Liz! I am honored. That cake looks and sounds quintessentially deLIZshush. I probably didn’t mention this to you yet, but I also love candy corn, so you won’t mind if a grab a handful of those babies will you? was for sure going for “quintessential” so yay 😉 Didn’t know you were a candy corn fan. The tri-color thing fascinates me. Love them just because they’re so silly and sweet. Ahhhh!!! Love that he says not to worry if the candy corn is oozing out as it’s supposed to be like that. ??? Wow. Just the name “deep-fried candy corn” should win some kind of award. That cake looks amazing! And you tried to say that you can’t make pretty cakes! Psh. And thanks for the cake kudos. This was a matter of using baking spray in the pan, then coating it with powdered sugar. No decorating involved. Thanks for coming over, Jenny! Hope your internships are going well. Thanks, John. If only we could live on chocolate and booze… Then again, there’s something to be said for variety. (looking forward to the octopus post 🙂 ) I’d imagine any pan would do for the cake, but the bundt pan makes it prettier. If you do make the vodka and are inspired to create a new cocktail recipe with it, would love to hear about it! Wow that cake looks good! I loved candy corn as a kid, happy memories! I’ve not had candy corn for years (cant get it in the UK!) but I love your grown up version! Great picture of your pucker- tini! Thank you, Jayne. Candy corn is a classic for sure. Hadn’t realized it’s not sold in the UK–crazy! Have seen DIY recipes (which I know you’re all over 😉 ), but it looked plenty complicated. Have a friend in Birmingham who has introduced me to all sorts of British sweets–you’re good even w/out candy corn. Thanks, Celeste. Go for it with the vegan version, then circle back with the result. Pretty please 🙂 Love that you’re here!! 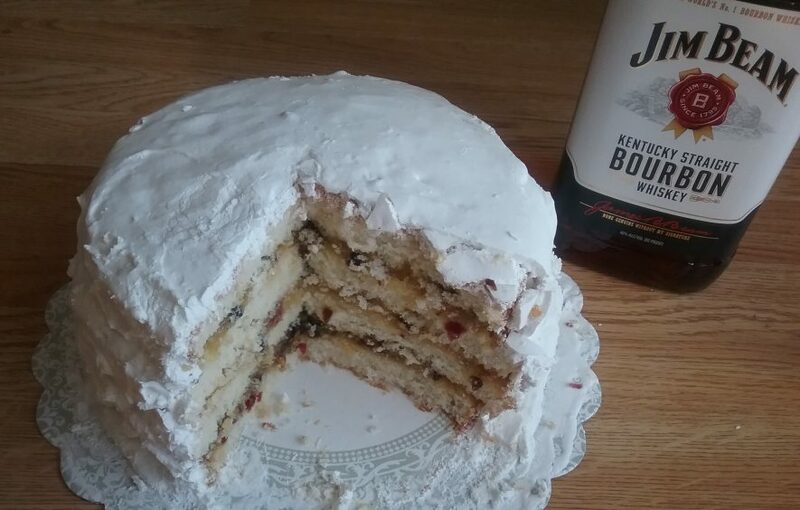 Saved a slice of cake and just made another batch of the vodka yesterday, so you’re good 😉 Thanks for stopping over and thanks for the kind words. Was thinking of your “community” post as I wrote this. Pretty cool how we’re forming these bonds. It is pretty cool…and I look forward to every get-together. Thanks, Jack. Do you suppose those cheery households have been sipping the candy corn vodka in between trick-or-treaters? Hope you’re enjoying your weekend of feasting! Couldn’t resist sharing Captain Beefheart’s take on Kandy Korn with you, Liz. Brilliant! You’ve connected food for fun, Blog of Funny Names, and You Tube. My new favorite song lyrics: “Yellow and orange and Candy be reborn, be reformed. Candy corn.” Perhaps Captain Beefheart (again, a food link) enjoyed a batch of “special” candy corn before working on this song and video? Creepy, but I couldn’t stop watching. Glad you shared. I just heard it for the first time today! With ambivalent feelings. Thanks, Teresa 🙂 It was quite an education for me!